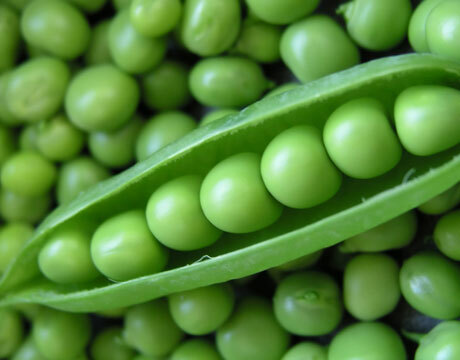 Pea Green is a colour name that immediately conjures up an image, but on reflection is it the colour of fresh peas, frozen peas, tinned peas or (forgive the accent) mushy peas that it brings to mind? It is clear that in the second half of the eighteenth century Pea Green was considered a special colour. The recipes for producing a Pea Green varied depending upon their date and also whether it was an oil paint or a Soft Distemper that was being made. A small handbook published in New Haven in 1812, by Hezekiah Reynolds, entitled Directions for House and Ship Building suggested mixing one pound of verdigris with ten pounds of White Lead to make Pea Green for exterior purposes. 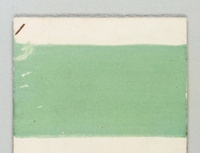 Peter Nicholson, in his The Mechanic’s Companion of 1825 gives the pigment Mineral Green as the main component of Pea Green.8 However, this is a very imprecise name and could mean several things – variously Scheele’s Green or a number of copper chloride or copper sulphate pigments. The above sample comes from a collection of distemper samples that date from 1807 and this was labelled Mineral Green on the reverse. Could it have been meant as a Pea Green? The last sentence has echoes of Goethe’s thoughts on green quoted above. 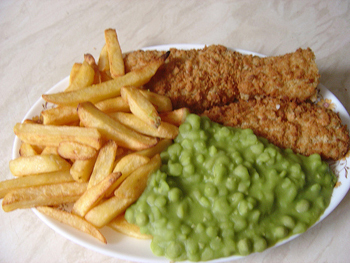 Pea Green appeared in two important nomenclatures of colour and, inevitably, there was a difference of opinion. 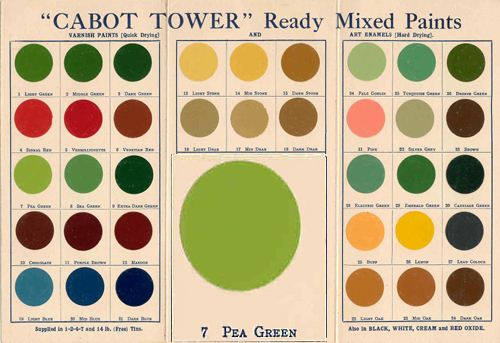 An example of Pea Green appears in both the Wilson Colour Chart and also the slightly later Horticultural Colour Chart of the late 1930s. 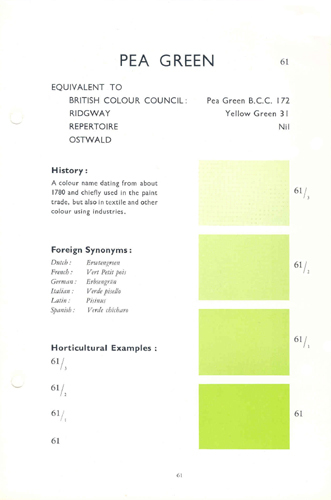 Note how it refers to the 1934 British Colour Council Dictionary of 1934 and also Robert Ridgway’s work. 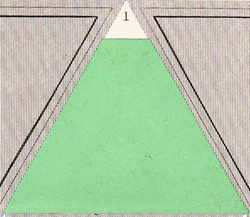 It did not appear as a colour in the Réptertoire des couleurs published by the Société française des Chrysanthémistes in 1905. 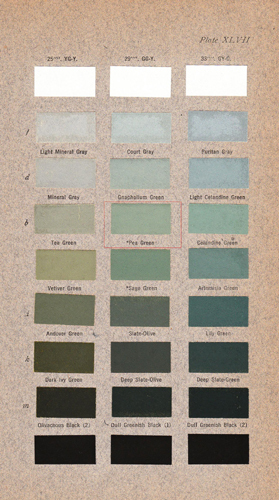 As with almost all of the colours shown on this site those shown here could be mixed into conventional modern paint by Papers and Paints Ltd. The striking SC271 shown in the photograph of the first floor room of the Georgian Group is one of those in the Traditional Colour range. 2 More can be learnt about the different prices charged in The Hierarchy of Colour in Eighteenth Century Decoration. 3 Roughly equivalent to a ½ litre of paint. 4 John Fowler and John Cornforth. English Decoration in the 18th Century. Barrie & Jenkins. 1974. 203. Much of chapter 5 of this book Colour and the painter’s craft was based on a poor understanding of the early technical sources and a commentary on this chapter can be found here – John Fowler – Inspired by the Past? 5 Quoted in Ian Bristow. 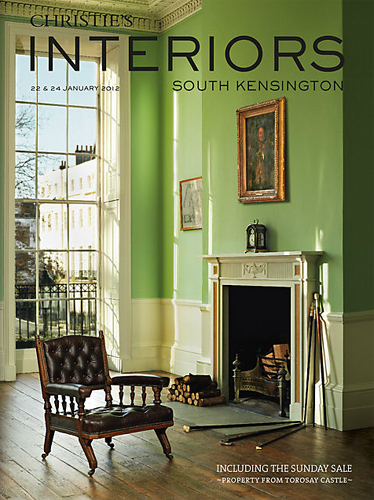 Architectural Colour in British Interiors. Yale University Press. 1996. 153. 6 Emily J. Climenson. Passages From The Diaries Of Mrs. Philip Lybbe Powys, Of Hardwick House, A.D. 1756-1808 1899. 147. 7 Johann Wolfgang von Goethe. Zur Farbenlehre 1810. Translated as Goethe’s Theory of Colours. John Murray. 1840. para. 802. 316. 9 John Bennett. The Artificer’s Complete Lexicon. 1833. 137. 10 T.H. Vanherman. Every Man his own House-painter and Colourman. 1829. 39. Spruce Ochre was a dark form of yellow ochre. It appears that he traded from no 51, King Street, Soho. 11 W.R. Laxton. 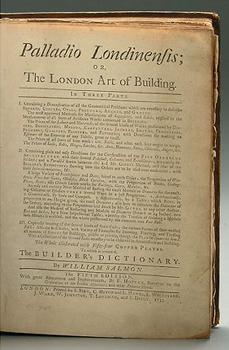 The Improved Builders’ Price Book. 2nd edn. 1818. 12 See for example – W.H. Swingler. Painting for the Million, and property owner’s companion of useful information. W.Nicholson & Sons. 1878. 40. Also, Ernest Spon. Workshop Receipts. 1873. 108. 14 This is referring to the British Colour Council’s Dictionary of Colour Standards of 1934. 15 This refers to the Wilson Colour Chart of 1938.